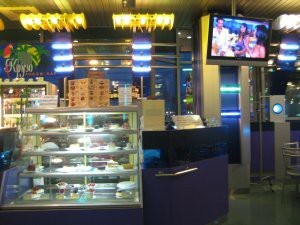 Visit to the Russian Federation, overnight train and 2 days in Moscow (2/2). 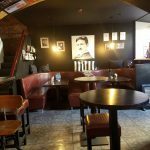 I get up the next morning, and like the song goes, its a new day at midnight, and I awaken with a new energy and sense of purpose.We have a tour of the Kremlin in the afternoon so in the morning we decide to go of exploring on our own. 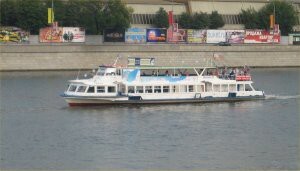 As we wander around, we see this boat sailing on the Moskva river (Moscow takes its name from this River). 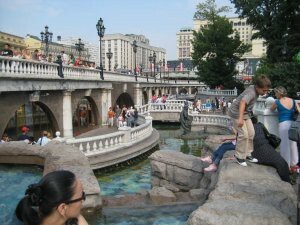 I had read in my Guidebook, that Moscow is unique for a “developed” country, in that it doesn’t have any ethnic specific areas like Chinatown or Little India.We manage to find Gorky park. I had been keen to see it, but as we get nearer the gates, I decide not to go in, as I have always imagined it a certain way and worry ill be disappointed, as a park is after all, just a park. 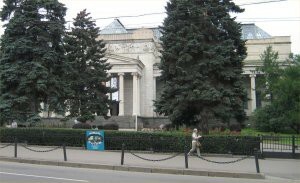 Instead, we head for the nearby Museum of fallen monuments which my friend Mike Delafield had recommended from his trip. There are loads of old statues, positioned around this sort of park next to a trading estate. 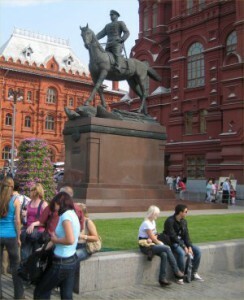 The hated “Iron Feliks” which previously stood in Lubyanka square. 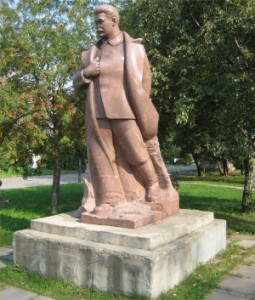 A Statue of Stalin. Look closely at the nose, and you will see where its been hit with a hammer and vandalised.One good thing, was that the weather throughout the day was superb. 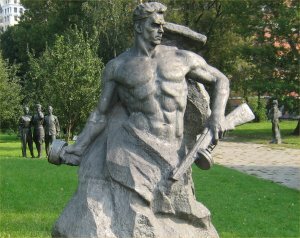 One of the more traditional communist images of a perfectly formed man with gelled hair, fighting for Mother Russia. This enormous statue of Peter the great sailing was an affront to the eyes. 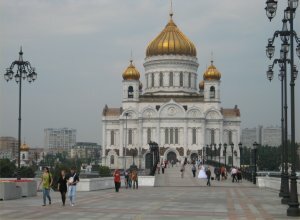 Cathedral of Christ the Savior.Originally built in the 19th century in commemoration of the Russian army’s victory over Napoleon. 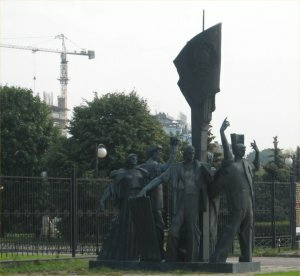 It was destroyed after the revolution on Stalin’s personal orders. Architectural drawing and measurements, were taken just before it was destroyed, this made a complete reconstruction to the exact specification of the original in 1994 possible. The Pushkin museum of fine art is a must-see sight in Moscow.Unfortunately, we were running late for our tour of the Kremlin, so passing it on the street was as close as I got. We walk around Alexander square, which we had seen the previous day from the other angle.It was a national holiday, so the place was packed (lots of people were drunk and staggering around, but overall the mood was friendly). There were hundreds of soldiers and police everywhere. The sun was up, and the colour of the water in the fountains outstanding. Our agreed meeting point, was this statue outside the Moscow state archives.Vasily Ivanovich Chuikov was the famous general who took Berlin from the Germans. Recognising him as a potential rival, Stalin “rewarded” him with retirement to a small village and a removal from public life. At the arranged time, we meet our guide and head for the Kremlin.Citadel of the Tsars, headquarters of the Soviet Union and now the residence of the Russian President. 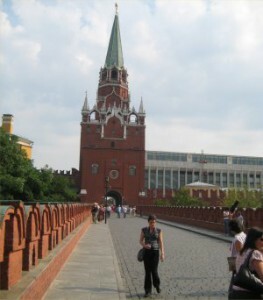 In the background is Trinity tower one of only 2 public entrances into the Kremlin. Napoleon marched in triumph through this gate in 1812. He left defeated a month later. Only official qualified guides are permitted to conduct tours in the Kremlin. Due to the holiday, It was closed to all but official guides and pre booked foreign tours. On the plus side, this meant that it was practically empty when we got inside. 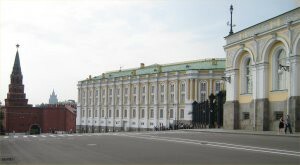 The state Kremlin palace. Built by Kruchev in 1961.It actually has 5 floors bellow ground, so that it doesn’t rise high above the older classical building. Its 6000 seat auditorium was previously used for political rally’s but today is a more likely venue for ballet and rock concerts. 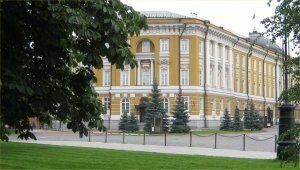 The ceremonial residence of the President of Russia. Since the Kremlin is a working arm of government, only half of it is available to the general public.Putin’s office. 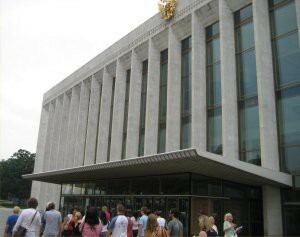 He does not live here (like in 10 downing street) and only the President and the ruling party have offices here, the actual parliaments are outside the Kremlin. Various diplomatic cars are parked outside the Senate building. 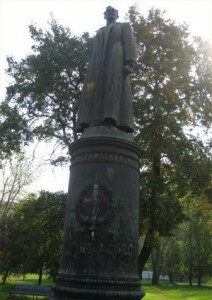 The famous Tsars Pushka (canon). 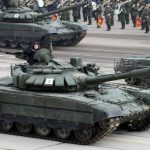 Weighing 38 Metric Tonnes it is listed in the Guinness book of records as the largest Howitzer ever made.It has never been fired, and considered to have been a showpiece of military might, rather than a functional weapon. This is illustrated by the Cannon balls. 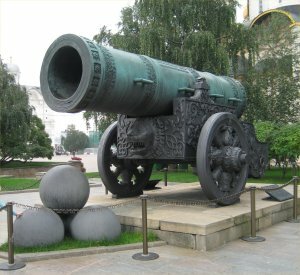 They were constructed more than 300 years after the Cannon, and can’t actually fit inside its barrel !. 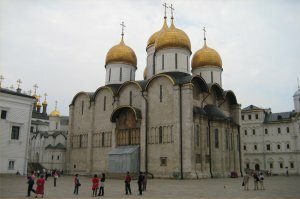 Cathedral of the Assumption.There are 5 churches inside the Kremlin. We walked around inside this one, but weren’t allowed to take any pictures. 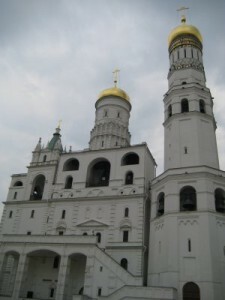 On the right, is the famous Ivan the great bell tower.It is called “Great” due to its height. In 1600 it was the highest building in Moscow. 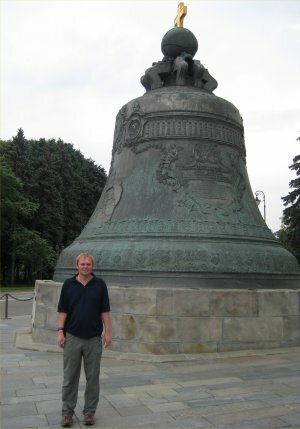 Outside the bell tower is the enormous Tsar Bell (the largest in the world).It fell from the tower in 1701 during a fire and shattered. The bell wasn’t terribly lucky, and its parts were used to make a 2nd bell. 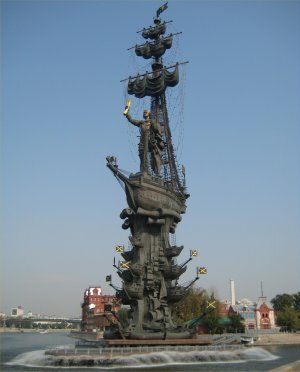 When the Kremlin caught fire in 1737, cold water was poured over the hot bell and a large piece broke off (its missing from the other side of the bell, and can’t be seen from this picture). With our tour complete, we leave through the 2nd gate.In the centre of this picture, is the state armoury, one of Stalin’s 7 sisters. Our guide advises us that the state armoury and the diamond room are definitely worth seeing (I was a bit surprised that they weren’t included in the tour). When I had a look, the queue’s for both were enormous (to be expected on a state holiday). I decided to kill some time and visit Pushkin square, where the first Macdonald’s in Russia was opened. Various roads were closed and I there were large crowds everywhere. I decided to just go back to my hotel. 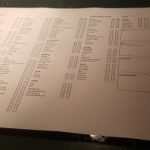 That evening I was supposed to go to the Circus, but decided not to.From my experience, some trips are holidays and some trips are adventures (many are both). A 3rd category of trip, is one which isn’t particularly pleasant, but broadens the mind. This was one of those trips. 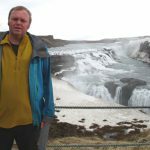 I have to say that I was miserable for most of it but in the end, I’ve experienced Russia. The night before I fly home, I find myself in the Hotel bar, paying a fortune for flat warm beer, and suffering offensive staff while I watch some ice skating reality TV program I hate.